Today I have a cute Christmas Peek-A-Boo card to show you. I saw this idea on another web site and thought it would be fun to recreate. And for once I didn't use traditional Christmas colours like I normally do. Well sort of. I still used green...but there is Delightful Dijon too and not a lot of red. I just can't seem to stay away from the Cookie Cutter Christmas bundle. I have used it again for this card. It is such a versatile set. To create this card I cut two thin strips of the Warmth & Cheer Designer Series Paper and glued them to the front of the card. Then I used the Layering Circle Framelits to cut three circles from a piece of Garden Green card stock. The greeting was stamped all over the Garden Green card stock using the ink of the same colour. 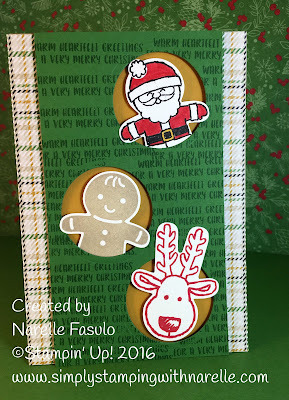 Then I stamped and punched out the Santa, Gingrebread Man and Reindeer. The Santa and Gingerbread Man was tucked behind and glued to the Garden Green card stock. This panel was then adhered to the front of the card using dimensionals. Dimensionals were then placed behind the head of Santa and the Gingerbread Man. The reindeer was then adhered the same way. I hope my instructions above make sense. If not, then please contact me for clarification. I hope you have a go at making a Peek-A-Boo card soon. If you want to make one like mine, then check out the product list below which will get you started. Oooohh aren't these bins just gorgeous. Getting more from your embossing folders.